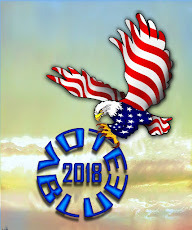 Despite one half a billion dollars spent by the Koch brothers, incessant Fox News anti-ACA broadcasts and an unfatohmable number (53 plus votes at $1.6 million per vote) of House votes to repeal the ACA, enrollments happened and reached revised projected CBO goals. See Advisory Dot Com (below) and the 2.11.2014 Brainwrap graph. And, of course, there are people who are so adamantly against medical coverage for people with no coverage, they actually fight against the law hand and foot. Hence, the silliness of the Hobby Lobby case and many CEO threats to reduce workforces if Obama was reelected in 2012. 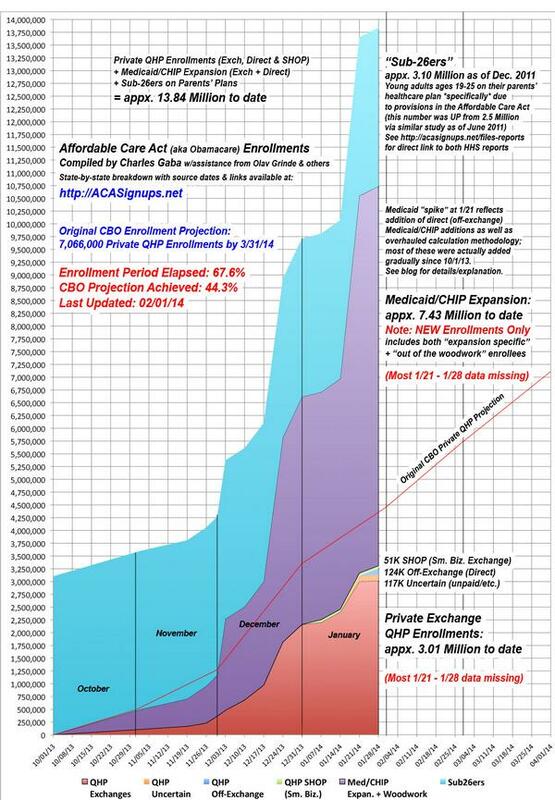 Some of us have followed ACA enrollments via the Charles Gaba, Brainwrap, webpage: ACAsignups.net. Others have supported the ACA without close enrollment scrutiny because it is the right thing for the nation. And, yes, there are many who do not support Obamacare, but will express an affinity for the ACA. I have developed the following set of BrainWrap running graphs (from 11.2013 - 2.1014) as visual representation of how enrollments have grown from the early weeks of HHS ACA website failure. The post was originally developed for my "Data Scroll" page and will be moved to that page after an initial run here. From the doldrums of a failed website to the revised projections! According to the Congressional Budget Office (CBO) the failed ACA roll out led to lowering its enrollment projections by one million. CBO previously projected that about seven million Americans would purchase health insurance policies through the ACA insurance exchanges in 2014. In its latest report, CBO lowered that projection by at least one million people, primarily because of the troubled roll out of the federal health insurance exchange website last fall. Projection line amended via addition of a revised projection line (Red lines in next graph). Let's see how enrollment continue for the next two weeks. Now, a bit of early fact checking related to Ms. Stefano's claims. Not only did she suspiciously “confuse” the $94,000 income threshold for receiving government subsidies to pay for Obamacare with the Medicaid expansion eligibility, she had the audacity to tell host Chris Hayes to “get his facts straight when he tried to correct the record. And, according to a new study from the health care advocacy group Families USA, it’s a provision that will mainly help America’s working poor and middle class. Most Americans, Pollack said, don’t know how the exchanges will work or that they are eligible for financial help to pay for insurance. That’s why Families USA released the report, he said. The report shows that families that make between $47,000 and $94,000 will receive half the money, that 88% of the credits will go to working families, and that those up to the age of 36 are most likely to be eligible. Families USA did not include people who fall below 138% of the poverty line because, in the states that will expand Medicaid, they will not need subsidies. Most of the people who have signed up through the Obamacare exchanges "already had insurance." Rich Lowry on Sunday, March 23rd, 2014 in a broadcast of NBC's "Meet the Press"
Are most Obamacare sign-ups people who had insurance before? If Obamacare was about anything, it was about getting more people insured. The law never promised to eliminate the uninsured altogether, but the Obama White House did say 32 million people would gain coverage, out of about 48 million who didn’t have it. Charles Gaba address this issues in his latest web page posting, while I am totally biased I find Gaba to be a far more reliable source of ACA related information than anyone associated with Charles and David Koch. Well, I forgot about one more thing: Not all of those 4.8 million "cancelled" policies were actually cancelled. Another commentor, danslabyrinth, reminded me that thanks to President Obama and HHS announcing their "grandfathering" policy which extended the deadline for existing non-compliant plans by a year (and, more recently, by another two years, to as far out as the end of 2016), this 4.8 million figure has already been vastly reduced. By how much? It's not clear how many people will actually be affected by the most closely watched provision of the new regulations, the two-year extension on policies that were previously subject to cancellation. The administration cites a congressional estimate of 1.5 million, counting individual plans and small business policies. About half the states have allowed insurance companies to extend canceled policies for a year under the original White House reprieve. The policies usually provided less financial protection and narrower benefits than the coverage required under the law. Nonetheless, the skimpier insurance was acceptable to many consumers because it generally cost less. "It's not likely to affect a large number of people but it certainly avoids difficult anecdotes about people having their policies canceled," said Larry Levitt of the nonpartisan Kaiser Family Foundation, an expert on insurance markets. "I think it's a small and dwindling number of people who are affected." Now, that 1.5 million figure isn't given as solid...but then again, neither is the 5 million figure (I've heard the number claimed being as low as 4.7 million or as high as 6 million, but the 6M sources are, to put it mildly, a bit shakey to say the least). In November 2013, the Administration announced that state insurance commissioners could give health insurers the option of allowing individuals and small businesses to re-enroll in coverage that did not comply with certain market and benefit rules, such as the prohibition against adjusting premiums based on health status, that were scheduled to take effect in January 2014. CBO and JCT estimate that, as a result, roughly 11⁄2 million people in the individual and small-group markets will renew policies in 2014 that are not compliant with those rules. In addition, because subscribers may renew such coverage between January and October of 2014, CBO and JCT estimate that half a million people will continue to be enrolled in noncompliant policies in 2015. So, here's what I'm willing to do: Since 5M is the most-cited figure, I'm willing to use that. And since 1.5 million appears to be the maximum number that have taken the administration up on their extension offer, I'm even willing to knock a couple hundred thousand off of that in the interests of being, shall we say, "conservative". This means that we can subtract 1.3 million from 5 million, leaving 3.7 million people who genuinely had to replace their existing non-compliant health insurance policy with a fully-compliant one...via either the ACA Exchanges or off-exchange, directly through the insurance companies. And as I explained yesterday, until I know how many of those 3.7 million replaced their policy off-exchange instead of on the exchanges, I have no way of knowing how many to "subtract" from the graph and therefore can't do so. We will await other and more concise fact checks related to Jennifer Stefano's performance. While we know Ms. Stefano practiced entertaining conservative media via providing a Bill O'Reilly like video, we have posted enough credible information for validation of her flawed punditry. There will be more study of her performance and we are confident the appearance on ALL IN will go down the path of simple fodder for LIVs (Low Information Voters).